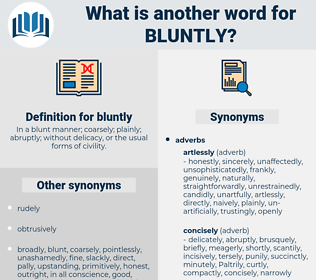 What is another word for bluntly? In a blunt manner; coarsely; plainly; abruptly; without delicacy, or the usual forms of civility. plainly, frankly, openly, unequivocally, explicitly, categorically, roundly, honestly, directly, brutally, clearly, blatantly, flatly, unambiguously, expressly, unreservedly, straight, candidly, Overtly, harshly, forthrightly, outright, downright, direct, starkly, crudely, definitely, totally, squarely, flagrantly, simply, emphatically, sincerely, utterly, quite.
" It means," I told him bluntly, " that I'll make a settlement upon your daughter and give you enough to live on." " I am afraid not," said Christopher, bluntly.